Alan produces a report each time the Chapter meets, on his involvement and activity with the Borough. If you would like to know more please contact us on the contact page. Is one of the chief ways we work with other Faith Groups across the Borough and with the Council. You can visit the THIFF website HERE. 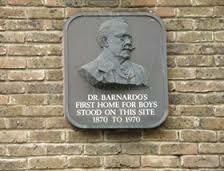 No 18 Stepney Causeway was opened by Dr Thomas Barnardo in December 1870 as a home for working and homeless boys. A leading Christian laymen he made a huge difference in the lives of 1000's of children over the last 140 years.